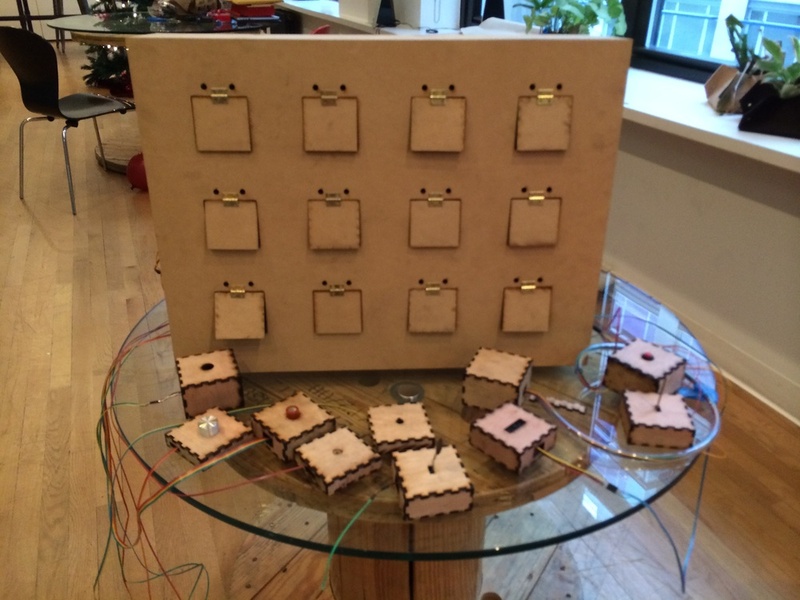 SVA IxD Physical Computing 2013 Final Projects – helloCircuits! Fundamentals of Physical Computing was for many IxD students their first exposure to circuits and electronics. This class was a hands-on studio introduction to physically interactive technology. Students learned how to interface objects and installations with viewers’ bodies and environmental stimuli such as motion, light, sound, or intangible data. The class started with basic laws of electricity and circuit design, turning on and off LEDs, and making homemade switches to control circuit flow. From there we quickly jumped into the world of Arduino microcontrollers and embedded systems, including an introduction to commonly used sensors that connect the physical world with designed objects. Proximity, sound, and light were commonly used sensors for early experiments; later many others were used including temperature, pollution, tilt, pressure, magnetic, and real-time data feeds. The first half of the semester involved intensive small-scale weekly projects aimed primarily at technical fundamentals and experimentation. Students connected programming skills they were simultaneously learning in their Slow Code class to the Arduino environment. This allowed them to more significantly customize their projects and manage the relationship between input and output. The midterm projects demonstrated an exciting variety of ideas and introduced the challenges of developing in hardware, software, and fabrication simultaneously. Projects ranged from wearable pollution sensors to gestural musical instruments, see additional posts in the Student Work category. Presence was an installation that visualized the ebb and flow of people at the SVA Interaction Design studio. It consisted of a set of physical buttons and a projection on the wall of the lobby. When people arrived, they “checked in” by pushing the + button. 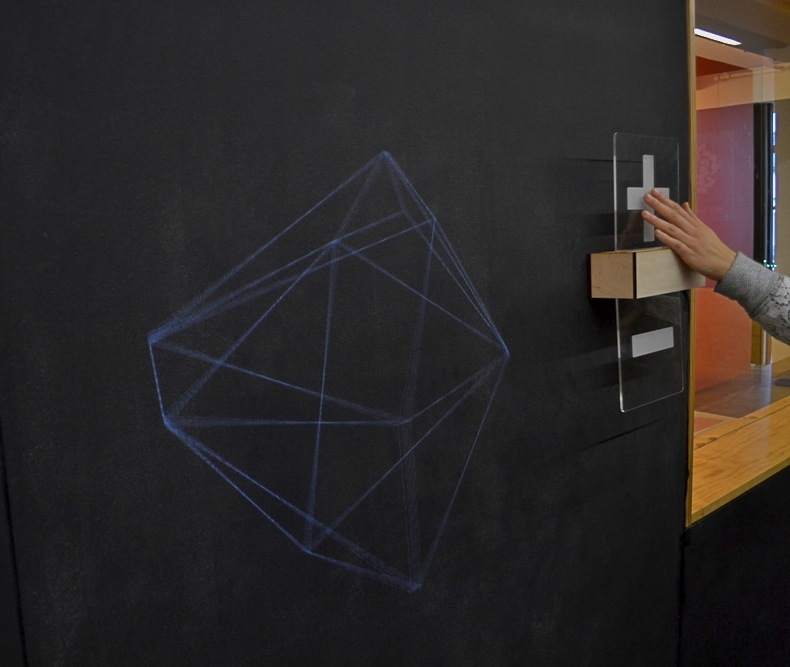 This added a node to the shape projection on the wall. When people left, they pushed the – button to remove a node. The simple interaction spoke to how each person’s presence can have an impact on the living, changing shape of a larger community. A physical box that wirelessly reads what the temperature is outside and then recreates that temperature inside the box. The box gives you the physical feeling of what the temperature is outside when you put your hand inside. The Emotional City is a tool designed to help architects gauge responses from specific user personas while designing projects. The tool consists of a large board, populated with models of configurable buildings and a robot which consists of an LCD screen and NFC reader. The designer/planner physically moves the robot each step of the way. Unlike a digital simulation, which focuses on point a to point b and very quickly running metrics, this forces the designer to take time to consider how each unit of the journey may affect their user. The robot is moved one step at a time through the board, a grid created by the buildings in order to simulate way finding/commuting/walking/running errands in a city. Inspired by the spirit of the Holiday, a whimsical interactive advent calendar celebrating the Twelve Days of Christmas countdown. Featuring 12 different sensors that activate a door to open a hidden surprise. A mysterious yellow box, with two cell phone numbers lasered on the sides and a printer ‘mouth’ with ‘PRIZE’ etched above it. The idea was to entice people at an exhibition or social gathering to text the numbers, at which point they would receive a reply encouraging them to find a buddy and keep texting. The game requires five different people to text a number to win – a relay race – encouraging social interaction and curiosity. The (deliberately underwhelming) prize was simply to receive a print out of all the texts in a random Dada Poetry-esqe style. The Wearamin is a wearable digital instrument which converts distance to musical tones using two infrared sensors and an Arduino running the Mozzi sound synthesis library. In this configuration, it’s been combined with an interactive light sculpture that reacts dynamically to the dB level of the musical output. The instrument output is running through a looping pedal to allow for multi-layered composition on the fly. 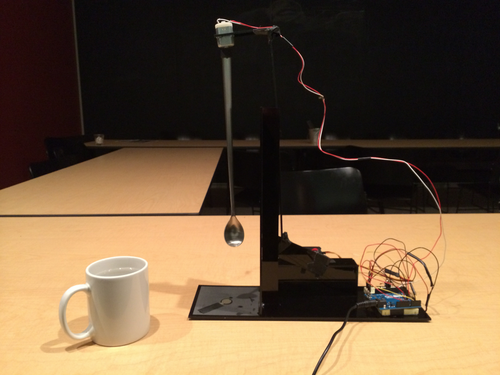 A device where one set the cup onto a platform, the stirring spoon would descend, and stir the beverage automatically. The spoon would automatically speed up or slow down based on the temperature of the beverage. The reasoning for that was that a cold drink with sweetener in it requires more stirring as opposed to a hot drink in which sweetener dissolves at a faster rate. 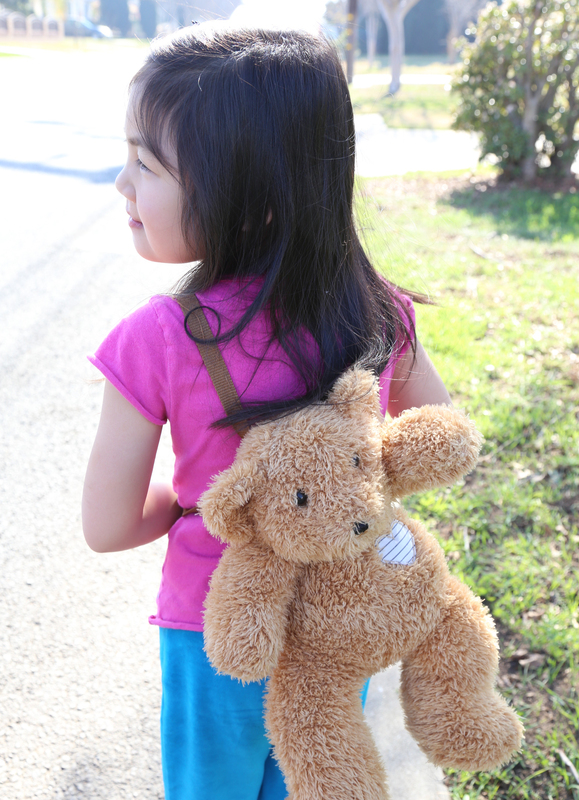 Beary is your average soft and cuddly teddy bear with a few high-tech capabilities. With a GPS and SMS chip built in for geo-tracking and texting, Beary’s owner has the ability to send for help from a guardian when lost. Through a discreet 3-step series of gestures, Beary’s owner can send a text alert with location data to the guardian, who can then navigate to the bear and activate a pulsing LED light in Beary’s heart to signal that help is on the way. An interactive installation to give the audiences an interesting unexpected experience and cheer them up with the chiasmus quote – “Don’t Count The Days, Make The Days Count.” A chiasmus is a clause inverted in a criss-cross structure to make a larger point. 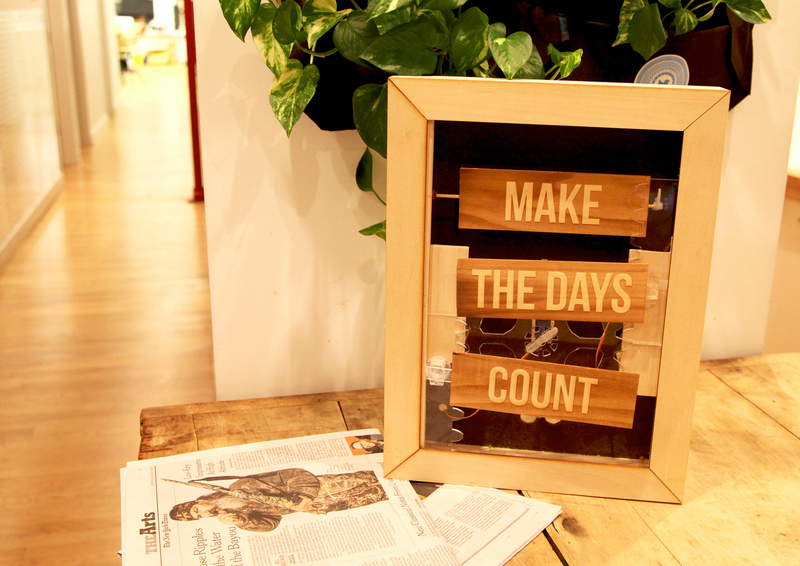 We split the quote into three wood panels and initial their order as “DON’T, COUNT, THE DAYS” in a frame. When the audiences approach the installation, the panels instantly response by flipping and inverting, changing the word order into the clause “MAKE, THE DAYS, COUNT”.